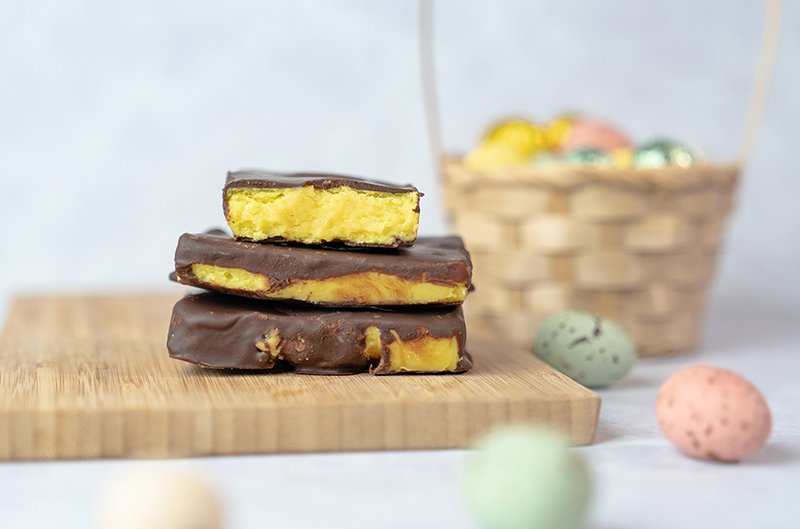 What better way to enjoy the long weekend than by creating your own delicious Easter treats! These are ridiculously easy to make and will have everyone coming back for more. If you want to get really creative, leave the turmeric out until the end. Split the ganache filling between two bowls and colour one of them with the turmeric. Roll the two fillings gently together before putting into the mould, a surprise of swirls for everyone when they bite through the chocolate layer! Add cream, white chocolate and tumeric to a bain marie. Stir until the chocolate is melted and all ingredients are fully integrated. Pour the ganache into the Mad Millie Raw Cacao Chocolate moulds and place in the fridge for 1 hour. Melt the dark chocolate in the bain marie. Remove the ganache from the moulds and dip them into the melted chocolate. We recommend cutting the bar into 4 pieces before dipping, the sweetness level on this treat means a portion of a bar is enough! Rest on a sheet of baking paper to dry.